Langen/Germany, September 4, 2017 — Socionext Inc. will be showcasing its latestAutomotive Technologies and Solutions at the International VDI Congress ’ELIV’ (Electronics In Vehicles) on Booth no. 39, at World Conference Center in Bonn (Germany), October 18–19. ViGO, a Remote Display Demonstration showing an enhanced Functional Safety concept, forfuture system architectures for both driver instrumentation and information systems. High speed display link with full duplex communications supporting touch displays is the key function of the MB88F33x graphics display family. The new Graphics SoC SC1810 which will be demonstrated at the Show manages a variety ofinformation from inside and outside the car and controls multiple displays, with higher definitionand image quality. In addition to further strengthening the graphics functions for in-vehicledisplay systems, the SoC contains the World’s first OpenVX compliant Image Recognition. The 360° Wrap-Around View System which is the solution for meeting the increasing safetyrequirement, to monitor a vehicle’s surroundings. This will bedemonstrated with the use of adrone. The latest CGI Studio HMI development tool and technology will be demonstrated showing CECIL, an Interactive IVI & Cluster, and the latest version of Scene Composer, which will show how a2D/3D scene can be created. Other products at the Show include Audio Alert for driver monitoring and assistance, and SEERIS® Graphics Engine IP, a scalable building block concept for graphics, display and capture. 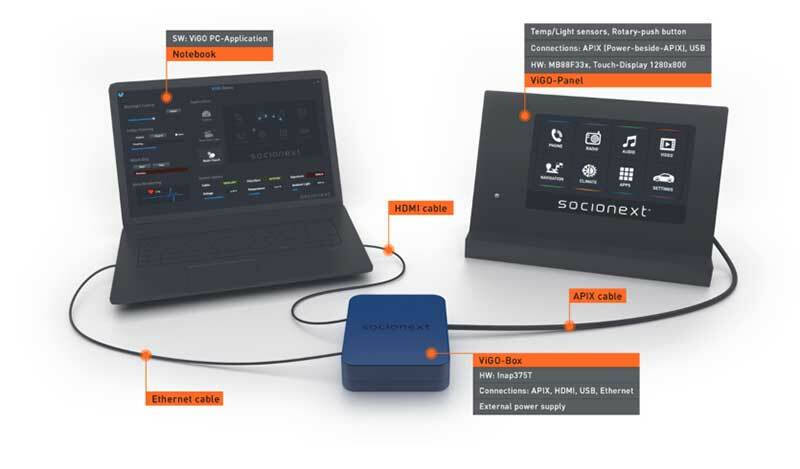 Socionext Embedded Software Austria GmbH in Linz (SESA) is a leading HMI tool provider and development partner for worldwide automotive, industrial, and telecommunication customers. SESA supports its customers with the CGI Studio tool environment as well as provision of software services mainly in the areas of HMI development and embedded software. SESA’s activities are driven by its close customer relationships and strong concentration on customers’ needs. Socionext is a new, innovative enterprise that designs, develops and delivers System-on-Chip products to customers worldwide. The company is focused on imaging, network ing, computing and other dynamic technologies that drive today’s leading-edge applications. Socionext combines world-class expertise, experience, and an extensive IP portfolio to provide exceptional solutions and ensure a better quality of experience for customers. Founded in 2015, Socionext Inc. is headquartered in Yokohama, and has offices in Japan, Asia, United States and Europe to lead its product development and sa les activities. For more information, visit: socionext.com.